Like death and taxes, change in life is certain. So why do struggle with something as common and everyday as change? We seem to hope that the things we love will stay exactly the same for as long as we want them to, just because we love them. The cycles of change we are most comfortable with are the cycles we work within everyday – the cycles of night and day, spring giving way to summer, the out-breath following the in-breath. These we can handle. But the changes that come from the four in the morning call, the best friend’s affair with your husband, the unexpected redundancy notice, the doctor’s call with your child’s test results – these we struggle with. Understanding how change works goes a long way to ease the uncertainty and the pain of loss. It is easier to bear difficult situations when we know that yes, this too shall pass. There are many theories of change, and how we process change. One of the most well known is Elisabeth Kübler-Ross’s five stages of grief: denial, anger, bargaining, depression and acceptance. 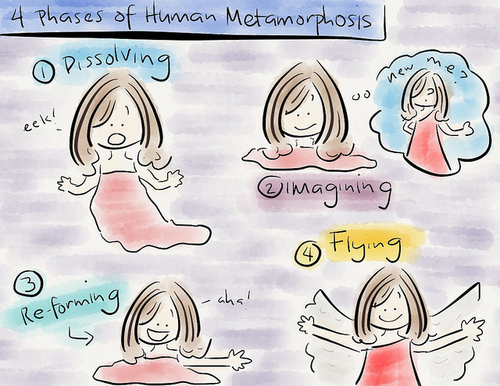 Another approach, taken by life coach Marth Beck, is to see change as a form of metamorphosis. The first part of the metamorphosis is the dissolution of the old life. This is the painful part, the part we wish wouldn’t happen. Then after everything has fallen apart (despite our desperate, doomed, efforts to pull everything back together again), there is emptiness. Out of this emptiness we start to imagine fresh possibilities, and gradually we re-form into a new way of being. Or, to put it another way, this passage of transitioning through change has four distinct phases. The first phase of dissolving, or death and rebirth, is the scariest, the one we resist the most. It’s where we lose our current identity. It can feel like everything is falling apart and everyone is falling away. And here’s a hint: there’s nothing we can do about it. Fighting won’t change the process; we’re better off cocooning ourselves, taking whatever baby steps we can in order to get through, and allowing ourselves to grieve whatever is lost. It also helps to know that it is the nature of this stage to feel as though it will never end. Others may have gone through this and found the light at the end of the tunnel, but we won’t. However, if we manage to stay calm – and even if we don’t – we will find ourselves being inexorably drawn through to the next phase. The second phase of imagining (or dreaming and scheming), begins when we start to imagine there could be a new life for us after all. Small hints will start to appear to us about how our old identity could be reformed into something altogether different. This is where we start to imagine new directions and daydream about new possibilities. We try out imaginary scenarios, gather information, and set new goals. 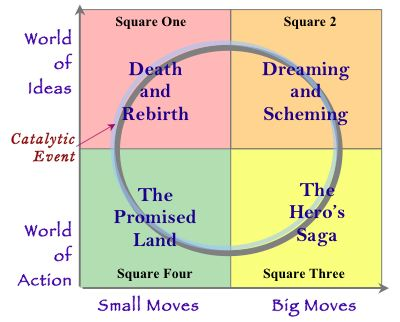 Once we feel the impulse to move from dreaming into scheming, we’re ready for phase three – re-forming (or the hero’s saga). This is where we go beyond imagining and into implementing our new plans. And, as Martha says …. we will fail. Repeatedly. This is the hero’s saga, and no hero worth her salt accomplishes anything without challenges and failures from which to learn. Inevitably we’ll come up against problems we didn’t expect. Stay calm, expect things to go wrong, and when they do, start over. Go back to dreaming and scheming and come up with a brilliant new plan. Which will possibly also fail. But just keep going. Eventually we’ll hit on something that will work for us, and then we’re into phase four, flying (aka the promised land). This is the payoff for all that pain and hard work. We’ve rescued our brand new beautiful life from the ashes of dissolution and we deserve to enjoy it. Until the next time. And that’s it, that’s the change cycle. We’ll go through this process repeatedly in life, and again each time it will feel like the end of the world. And it is. But the new world is waiting for us just on the other side. Everyone tells you to follow your passion, but how do you get there? This is about the journey of moving from dreaming and trepidation, to making it happen - and sharing what works and what doesn't along the way.